1) The mysterious Dragon balls appear!! Son Goku becomes a child!? 2) I am the Leader! Pan Flies into Space!! 4) Wanted!! Son Goku is a criminal!? 9) Damn!! Son Goku Leaps into the Trap Planet!? 14) Can We Get the Rhythm Down Perfectly!? Capture Ruudo!! 15) "I Can't Take Anymore!!" Pan Runs Away!? 16) Machine Planet M2... Gill the Backstabber!? 17) Waiting for Pan!! The Tactical Strike to Rescue Son Goku!! 24) Bebi's Counterattack!! Target the Saiya-jin!! 26) Gohan and Goten... The Worst Brotherly Spat!? 28) Son Goku Returns... "All of Earth is My Enemy!?" 29) This is Really Bad!? Super Saiya-jin 3 Fails!! 30) Goku Has Passed On!? "I'm Dead." 33) Eat This, Bebi! New Uubu's Killing Light Ray!! 34) The Transformation Fails!? Giant Ape Son Goku's Rampage! 35) Final Strength! Son Goku Becomes Super Goku 4!! 37) Bebi and Son Goku -- Double KO!! 41) Tenkachi Budoukai. Who Will Be Satan's Successor? 48) This is a Surprise! Shenlon is the Enemy?! 55) Buruma Begins Working on Vegeta's Makeover Plan! - All material copyright of Pojo.com. This site is not associated with Cartoon Network or TOEI Entertainment. 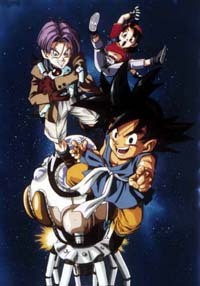 Dragonball Z is a registered trademark of TOEI Animation CO., LTD.